When you have a presentation platform like SlideShare, you can make good use of the user generated content to promote that platform. In this case, SlideShare email marketing involves sharing presentations by others, and urging you to add yours to the ever growing collection. 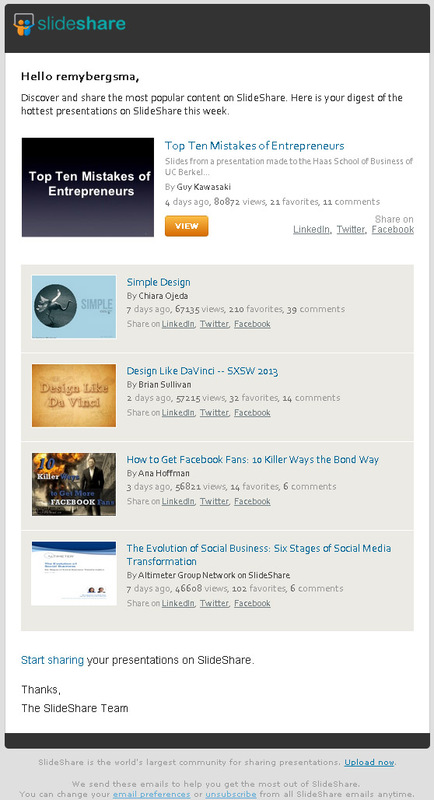 Here’s the email I received recently: subject line was ‘Hot on SlideShare This Week’. The email is not big on text: just an intro and sign-off, and a description plus stats to the five presentations included. That isn’t a problem however: the presentations have clear titles (hint), and they are also urging me to share my presentations on SlideShare. They have little nifty things in there to make the email bullet proof as well. The ‘view’ button for instance, is both text and image: if no images are loaded, the link will still be visible and work just fine. The same goes for the social sharing links: instead of using the LinkedIn, Twitter and Facebook icons, they use text links. This means less distraction from those little icons, -and- easier sharing (because a text link is bigger in width than an icon). Lastly, here’s a brilliant line: ‘We send these emails to help you get the most out of SlideShare’. This instead of an often used line ‘we send you this because you signed up etc…’. Even if I won’t upload any presentations soon (you never know) and even if I won’t view any presentations in this SlideShare email marketing campaign soon, it will still sit in my inbox waiting until I interact with it. If you have a platform or service from which you can crowdsource content, by all means: do so. It will help in getting more momentum and branding, and help others get the most out of it, just like SlideShare notes.